inner-city apartments with access to the myriad of services on offer nearby (STCA). with a 900mm-wide oven, five burner cooktop, walk-in pantry and ample cupboard and bench space. The living area opens out to a delightful vine-covered paved courtyard. There is a double garage, and a private laneway allows vehicle access through a remote controlled gate. Just a short walk to the CBD, cafes, parks, walking tracks and all that Quarry Hill has to offer, this lovely home is a rare find. Lake Weeroona. Even the city centre is just a 25-minute walk from this quality property with extra elbow room. Great presentation and a prized position to suit the owner-occupier as well as the property investor. Contact Matt Gretgrix of Bendigo Real Estate for open days and private inspections. alfresco with timber decking, ceiling fans and mood lighting. A large garden shed to one side of the house, with concrete flooring, power and lighting, creates an excellent workshop. A 6x9-metre shed has power connected and concrete flooring. Rainwater storage, a stable, tack room and feed storage are further assets. steel wall oven, gas cooktop and a breakfast bar complete the tidy kitchen. Landscaping is modest and the 32-square-metre shed sits on a concrete slab. A wise buy to suit a variety of purchasers including first homebuyers and property investors. Phil said vacant possession is available and expected rent return is $330 to $340 per week. Colorbond fencing on three sides and all town services available. ral area, tradies would be especially appreciative of this property. to arrange and inspection contact Robert Ketterer at DCK. undercover parking and openbay parking. A special offering in the heart of Bendigo with nearby theatres, galleries, boutiques, restaurants and parkland. Onsite parking is available and the property has access via Bell Street at the rear. Serious about selling your property? 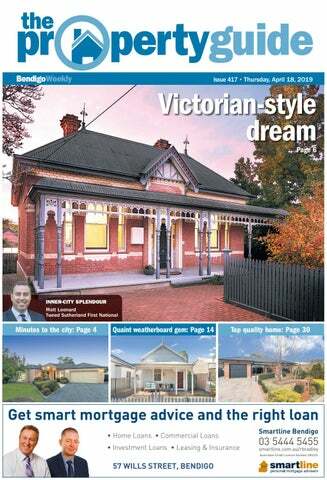 The Property Guide has the largest circulation of any property paper in Bendigo, and is delivered free to your letterbox every week. Why waste time advertising anywhere else? 120 Barnard Street, Bendigo Circa 1937, this magnificent Spanish style property showcases the timeless elegance of the era. A brilliant foundation for your own contemporary flair, with intricate leadlight entrance and central hallway, gracious formal lounge and dining rooms, granite kitchen with meals area opening to a sun-drenched courtyard with pizza oven, master bedroom with ensuite & views to the pool, double bedroom with bay window and fire place, spacious study/third bedroom, generous family bathroom and laundry with storage. 5/17 Bobs Street, Bendigo Situated off the quiet end of Bobs Street, overlooking the beautiful scenic views of Lake Weeroona, & minutes from the Bendigo CBD, this low maintenance, convenient & functional designed townhouse has a lot to offer! Tucked away just minutes from the CBD, a short walk to supermarkets, amenities & Lake Weeroona sits this neat as a pin home on large land allotment. The perfect investment opportunity! Call the team today! while the kitchen has ample bench space, pantry, and gas appliances. The bedrooms are spacious and boast built-in robes, and there is a main bathroom as well as separate laundry. It’s a short drive to the city and Golden Square itself has plenty to offer with schools, shops and supermarket. water storage and catchment dam are some more inclusions. Very impressive is the two-car garage with workshop space, roller doors, concrete floor and mezzanine storage. Tim said it’s a 10-minute drive from the city and future subdivision might be possible (STCA). Character and convenience near local services and public transport. rooms, a second bathroom and a small landing area/ study nook. Outside are landscaped gardens on the block which measures about 454 square metres. There is wonderful potential in this historic property and given its idyllic location would lend itself to a lovely family home or potential investment. HIS huge family home on a 900-square-metre block has been cleverly laid out to accommodate multi– purpose family living. At the front of the house there is a separate, carpeted living room, the main bedroom with its ensuite and walk–in robe and the spacious kitchen and dining room. There are also three bedrooms, the bathroom and a large laundry with copious amounts of storage. The kitchen, as with the rest of the home, is in excellent order with state-ofthe-art appliances, generous bench spaces and storage. Adjacent to the kitchen is a fabulous covered outdoor entertainment area which has been enhanced by hardy carpet, a unique industrial gas heater and sliding windows and blinds. The back section of the house is a special surprise. CALIFORNIA GULLY Consisting of two carpeted bedrooms with individual split systems, a third room which could be used as a rumpus or study, as well as a luxurious bathroom with a spa bath. It would be perfect for a teenager, elderly person or as an airbnb. There is a side gate which allows access to the double garage. Close to Eaglehawk’s numerous amenities this house is in a super position. Just six minutes from Epsom Village and Epsom train station, this peaceful and tranquil home is hidden away in the heart of the Wellsford Forest. Offering a large dam, tanks, outbuildings, chook pen and more, this contemporary home is perfectly set up as the ideal retreat away from it all. This impeccable property is within close proximity to the Farmers Arms Hotel, Catherine McAuley College and the O’Keefe Rail Trail. Beautifully finished throughout, the home also boasts a great alfresco space and fantastic shedding complete with the ultimate man cave. 57 Forest Street BENDIGO Built in 1886, this incredible example of goldrush architecture has been occupied by the one family since its construction. Beautifully positioned in the heart of the city on a generous allotment with a charming established garden, this unique property is truly a rare opportunity to secure a slice of Bendigo’s history. INSPECT Anytime YOUR FOREvER HOmE LIvES HERE! Located in a lovely quiet street in Strathfieldsaye this 709m2 block ticks all the boxes for a stress free build. Part of a small 16 lot subdivision, with quality houses already completed, this will be the perfect place for your forever home. Near level allotment, with no BAL or BMO, and a great Northerly aspect for a solar passive build. Great covenants, room for a pool or a shed. Soil test done, NBN ready, short walk to secondary school bus stops and only a few minutes drive to the shops and all that Strathfieldsaye has to offer. One large titled lot still available. square metres with a paved patio. All up, a lovely home for the buyer wanting an innercity lifestyle near shops and galleries. Inspection is highly recommended for those needing a central property for Airbnb-style accommodation. Your agent for this property is Jesse Forbes of Barry Plant Bendigo. ues outside with an undercover raised decking which steps down to an adjoining paved entertainment area. The main bedroom features a walk-in robe and ensuite, while the other two bedrooms both have builtin robes and share the main bathroom. A quality low-maintenance option with some 420 square metres of land to enjoy. EPSOM and future development is subject to council approval. An interesting piece of land with potential to diversify your portfolio. Contact Tom Maher for more information and site inspections. catchment dam and about 44,000 litres of rainwater storage. Licensed estate agent Chris Garlick said the property is much-loved by its owners who have decided to downsize. We have to say, this property is especially appealing for buyers wanting space, serenity and solar power. LISTING from DCK Real Estate comprises two land titles and two houses with an inner-city address. On tree-lined Hargreaves Street the properties are side-by-side with street frontage and onsite parking for about 12 cars. Number 434 is a modest 1940s home with original features such as decorative ceilings and leadlight windows. It has four principal rooms as well as entrance hall plus separate bathroom and laundry room. Situated at number 436 is a Federation-style house with return veranda and glorious box-bay window. The building has five principal rooms as well as entrance, sunroom, restroom and a kitchenette without appliances. Licensed estate agent Kaye Lazenby said the properties have commercial one zoning (C1Z) and will be sold as a whole. The total of the two titles is approximately 762 square metres. “Some maintenance is required if the buildings are to be retained, otherwise the possibilities seem endless.” Commercial zoning allows for a variety of uses including approved office, retail, entertainment and residential. The buyer might explore renovation, extension, further subdivision or house removal and full redevelopment (STCA). conditioning unit. There is also a bathroom and laundry. allow height for a caravan, and 22,5000-litre water tank. property presents a rare chance to combine country quiet with convenience. For easy driving directions visit www.tsfn.com.au and type Ravenswood in the quick-search box. Text ‘Belvoir’ to 0488 810 392 for a copy of the vendor statement. Here is a once in a generation opportunity to secure a multipurpose CBD property. This early 1900’s property on approximately 655m2 lot, was recently used as a boarding home & comprises 12 bedrooms, 2 kitchens, 3 shower rooms & multiple toilets. The property is Zoned commercial 1, and is located opposite Bendigo train station & Bendigo Marketplace, with rear & side access via laneway. Suitable for a grand residence, offices, B & B or a mixture (S.T.C.A). Off street parking is available for 6-7 cars with an open backyard & historic stables to add to the property’s charm. Sophisticated, unique, serene 4 brm contemporary lifestyle property. Less than 5y.o. qualifies for $20k FHB grant, stamp duty exemption! Designer styling, soothing ambience. 900mm induction cooktop, matching oven, DW, timber table-height breakfast bar at island, huge butler’s pantry hiding fridge & sm appl’s. Twin glass corner doors connect open plan zone with alfresco. Lounge, master brm with spacious WIR, deluxe ensuite. Study with BI desk, WI linen room. R/C duct heat/cool. Landscaped grounds, dbl garage. Huge brick 5 BRM + study, dbl storey where effort will reap rewards. ‘60s architecture: wood floors, 9’ ceilings, dec cornices, timber architraves, pelmets. Glass sliding internal doors, glass cabinets, serveries in kitchenette & huge kitchen connect with living areas. Ideal student accom or redesign/reno for family home, both floors have bathrooms. Upstairs has large lounge & main kitchen, downstairs kitchenette & narrow living. Outdoor living balcony, broad terrace, dbl garage. Walk to shops, CBD, sports, schools, college, uni. at Target over the next few days, in conjunction with other REIV agents in Bendigo, to help spread the load of the ageing population of volunteers. Paul will be visiting several cafes and pubs over the next week so be sure to buy a badge if you see him about. Please dig deep for this worthy cause. Mt Alexander. Setting superior standards, lots within this release are uniquely bordered by seven hectares of protected native bushland reserve. Whether you’re looking to raise a thriving family or exploring the option of retiring in a serene location, now is your opportunity! The release of Stage 3 at this elevated boutique Estate is here, with 19 lots ranging from 604m2 to 965m2. Wider, deeper lots providing plenty of space for larger homes, shed or pool. 1km from Bendigo Stadium, 3kms from schools and facilities of Maiden Gully and Golden Square, 8kms from Kangaroo Flat. Also the home of a new Shine Bright Kindergarten & Childcare Centre. 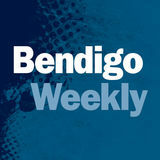 At the heart of all of Bendigo’s city and outer suburbs facilities. Period charm, functionality and close to CBD are just some of the key features of this property. Great condition inside and out. Would make a very comfortable home. Good size allotment. The team at Mawby Property would like to wish you and your family a safe and Happy Easter. For after hours assistance please call 5442 1122 to speak to our on duty agents. Business for sale - Rocklea Cafe. Located in Bendigo Homemaker Centre. Good turn over and low rent. The position is first rate and offers the privacy and space of acreage, whist being a short drive to the CBD. Our office will be closed from 5.30pm Thursday 18th April and will reopen 9am Tuesday 23rd April. We will also be closed on Thursday 25th April for Anzac Day. The team at Professionals Bendigo would like to wish you all a safe and Happy Easter. Superb rural property offers, lifestyle & potential income. With a spacious country style homestead on 75 Ac appox. Your local news. Your local paper. Delivered to your door. Family home features functional kitchen includes quality appliances, good storage & breakfast bar while meals/family enjoy north-facing windows & external access. All bedrooms have BIR’s & ceiling fans (WIR & ensuite to main). Year-round outdoor living in expansive covered alfresco or relax in gazebo overlooking the rear garden. Neat landscaping, garden shed, rain water tank & rear access for caravan trailer etc. Stepping beyond the front verandah of this cute corner cottage, you are greeted with high, pine-lined ceilings throughout. Living room features OFP, gas heater & a/c with ceiling fans in every room. Functional kitchen w/OFP, gas heating & cooking, dado lining boards. Low maintenance block w/ garden shed, ext. WC, as-new Colorbond fencing & single garage. Restumped, rewired & replumbed. Bridgewater On Loddon 4 Main Street Since 1880, this beautiful Victorian building has been at the heart of the community. Throughout the property are perfect examples of original architecture as well as high ceilings, gas log fireplaces & Baltic pine floorboards. In the bedrooms are carved, hardwood mantlepieces, open fireplaces, & original brickwork. The kitchen features quality cabinetry, woodstove & modern stainless steel appliances. Head to our website to read on. Easter Special - final three lots in Stage 1 up for grabs, with already a massive $10,000 off! We will be giving away a $1000 voucher upon settlement to the final 3 purchasers of these remaining lots in the emerging Hidden Meadows Estate. Hidden Meadows is a limited land release in a desirable location, nestled between Guys Hill Road and Strathfieldsaye Road with quality ready-to-build residential blocks in the heart of Strathfieldsaye near schools, shops, doctors, Strathfieldsaye Tavern and sporting facilities. It is the last hidden piece of land in a family friendly community and it is surrounded by established homes. Strathfieldsaye offers families a quality lifestyle with excellent local services and situated only 10 minutes to the city. leadlight windows. The formal lounge has a lovely bay window, an elaborate ceiling rose and a marble fireplace. A second living room is centrally positioned, while at the rear is a large dining room and study. the triple garage with office, wood fire and powder room. There is also has access to Percival Street. Combining quality, practicality and style, come and see for yourself what this exceptional home has to offer. HIS general residentially zoned allotment offers a very rare opportunity to build in the highly regarded and popular Spring Gully area. The block measures 2348 square metres, meaning there is plenty of space for a large home, a pool or shedding, depending on the need. The land is set back from the road giving future buyers plenty of room to build, as well as privacy. Other highlights include the extensive work already carried out to the property to reduce future costs. There is also the option to develop the property further and maximise its potential by subdividing it (STCA). floor providing access to a balcony overlooking the finer features of the central business district. Perfectly low maintenance and stylish, this property is ideal for investors or those simply looking to be a stone’s throw away from the CBD of Bendigo. Design and build a home that compliments your lifestyle amongst this established and scenic neighbourhood, within an easy walk to Spring Gully Primary School, café, recreational facilities, walking trails and only five minutes drive into town. SECLUDED BUSH HAVEN ONLY MINUTES FROM TOWN • Beautifully presented brick veneer set on approx 10 acres of native bushland with plenty of native wildlife to enjoy. • Cosy Wood heater plus split system heating and cooling. • 6 month old 4.8kw Solar system. SPACIOUS AFFORDABLE FAMILY HOME • Four bedrooms, main with ensuite & WIR, others have BIR’s. • Wide entry hall & formal lounge, dining & family room. • Kitchen boasts ample cupboards, 900mm stainless steel oven/cooktop & large breakfast bar. Our sales team are available over the Easter Break. HE opportunity exists to secure a near-new home unit at Aviva Communities Bendigo in Kangaroo Flat. Just six months old, this pristine villa offers independent living in a friendly environment with a host of facilities. Lawn bowls, cinema, swimming pool, gymnasium, bar, community lounge and gardens are among the lifestyle features. The villa unit offers open-plan living, modern kitchen, dishwasher, microwave and new wall oven. the village, this unit will impress the over 55s seeking a quality lifestyle near Lansell Square and public transport. Visit Aviva Communities Bendigo and stroll along Botanic Drive to find this villa. Happy & Holy Easter Everyone from your Team. Mud-brick Home & Studio on 5 Acres If you feel yourself in need of a wonderfully natural getaway at the end of the working day, this might be a dream come true – and just 15 minutes from Bendigo’s thriving CBD! In a serene bush setting of approximately 5 acres, alive with native flora and fauna you will find a very inviting mud-brick home full of authentic rustic features. I would make the loft room my own! Although the bungalow is a very appealing prospect as well. Period Style Homestead on 38 Acres Ideally situated only 8 minutes from Axedale and walking distance to Lake Eppalock, this beautiful old farmhouse offers a wonderful family lifestyle. The home comprises 2 spacious living areas, a red gum kitchen and boasts many original features such as 12’ patterned ceilings, leadlight windows and an open fireplace. Additional features include a huge solar system, 7 dams, 2 main paddocks and 2 sheds including a truck size workshop. Huge Factory Complex, Farm, Water Rights And Residential Land FACTORY COMPLEX – 2.14 Ha / 5.29 Ac (selling for just a fraction of replacement cost) Factory 1 – Approx 3150m2 Factory 2 – Approx 3400m2. FARM – 21.57 Ha / 53.29 Ac Productive land with access to the backbone channel. WATER - HR water shares 49.8 megs, LR water shares – 21.1 megs. RESIDENTIAL Disused home on approx 400m2 plus approx 1000m2 vacant block. plus four bedrooms and an executive-sized study. Keyless entry, intercom system, ducted vacuum, jarrah flooring, wood fire, sunken spa and mosaic tiles are excellent features. The kitchen boasts stone benchtops, custom crafted chef’s island, Bosch dishwasher, Franke sink, Miele glass-topped hob, café nook and walk-in pantry. The property has remote-controlled gates, double auto-garage, internal access, outdoor dining, elevated decking and a hidden garden. An inspection is a must for this stunning property. derful bay window. It has a great dining room area and sparkling kitchen with plenty of cupboards and bench space. This spacious home has two good-sized bedrooms with built-in, mirrored robes. The toilet is separate and the three piece bathroom is immaculate. The low-maintenance, shaded garden has a delightful courtyard which features a lovely gleditsia and the single garage is remotely controlled. Adding to the home’s general convenience is the gas heater and evaporative cooling. All up this property represents a fabulous opportunity. Sources: CoreLogic Australia – Media Maximiser January 2015. Based on sales of houses and units; emma, 12 months to November 2014; digital trend compared to 12 months to November 2014. Survey conducted by Ipsos MediaCT, people 14+, Nielsen Online Ratings, November 2014, people 14+ only. 14 OLINDA STREET True Period Treasure in Quarry Hill • Brilliant location a short walk to Bendigo CBD. • Period features including 12ft ceilings, decorative cornices and fireplaces. 2 CARPENTER STREET Classic Period Home • A complete renovation in 2012 by award-winning GA & PA Pilcher Builders. • Three extra-large bedrooms, two with built in robes, master with walk-in robe and ensuite. • Two living areas and so much potential to restore to something truly special. • Polished timber floors, 11ft ceilings with period features. Townhouse Close to Central Bendigo and La Trobe Uni • Kitchen, dining and living zone, large lounge, main bedroom with ensuite and walk in robe, two bedrooms with built in robes, third living area and study nook. • Dble garage with auto door plus side vehicle access. • Currently leased, vacant possession is available. der room, the home will suit a variety of buyers. Another favourite is the home’s timber kitchen with generous storage, ample bench space, breakfast bar and double fridge space. Outside finds two alfresco areas, pergola roof, natural gas connection and mini outdoor kitchen. Darren Waters of PH Property said “this property is ideal for someone with a caravan, boat and trailer.” “It will also work just as well for an investor or a growing family.” An immaculate home in exceptional order and is close to all Eaglehawk has to offer. 3 bdrm, 2 bath, renovated kitchen/meals area, d/washer, heat/cool, enclosed yard, c/port, dble gge and covered ent area. Commercial Properties 326 Lyttleton Terrace, Bendigo /DUJHFRPPHUFLDOSURSHUW\ORFDWHGLQ%HQGLJR&%'SFP (inc GST) + all outgoings paid by tenant. Available Now. Looking for a professional and mature property manager? Call us today for a free FRQß&#x201D;GHQWLDODSSUDLVDORI\RXU investment portfolio. posted or hand delivered to our office. Our philosophy is simple, we look after your property as if it were our own and provide you with prompt, good old fashioned personal service. Our experienced team of Property Managers provide the highest level of service and support to our landlords & tenants alike. 5264 Calder Highway, Big Hill .................................$320pw A Spanish style home offers a mix of three levels. The dining room/ sitting room offers two gas log fires that that heats the whole house. The kitchen features gas cooking appliances, plenty of cupboard space and a dishwasher. The main bedroom has its own separate lounge area, walk-in robe, split system, plus ensuite. The other bedrooms have built-in robes, plus a main bathroom with a spa. Itâ&#x20AC;&#x2122;s close to Big Hill Primary School and a short drive to Kangaroo Flat shopping plaza, Bunnings and other facilities. (Please see agent for property boundary). 6-month lease agreement available. $410p/w 1br with built in robe + 2 way access to the bathroom, large open plan kitchen/dining/living area with gas cooking, electric oven & dishwasher, split system heating & cooling, European style laundry, security system with digital monitor, close to CBD & train station. *Semi Furnished Apartment*1/94-98 Mitchell Street. NORTH BGO $310p/w 2brâ&#x20AC;&#x2122;s with BIR, main with 2 way access to bthrm, large open plan/living/dining room + kitchen, kitchen with ample cupboards, WIP & gas cooking + S/S appls, 2 x split systems, over sized single garage with internal access to the large laundry/mud room, secure back yard with patio. 2/20 O Neil St.
3 & 4 BEDROOMS QUARRY HILL $300p/w 3brâ&#x20AC;&#x2122;s with BIRâ&#x20AC;&#x2122;s, formal lounge, reverse cycle split system, updated bthrm, kitchen with d/ washer, + sunroom at the rear, carport on a low maint. block. 1/17 Spring Gully Road. KENNINGTON $310p/w 3brâ&#x20AC;&#x2122;s, renovated bathroom, kitchen with gas cooking, dishwasher & excellent cupboard space, gas wall furnace for heating and split system for cooling/ heating + ceiling fans, RACV alarm system, lrge block. 86 Neale St. GOLDEN SQ $300p/w 3brâ&#x20AC;&#x2122;s, 2 with BIRâ&#x20AC;&#x2122;s, open plan kitchen/ dining area with gas heating & split system air condition, kitchen with gas oven + stove & spacious BIP, main bthrm with shower & toilet, sep toilet from laundry, fully fenced with garden shed. 3 Norma St. BIG HILL $320p/w 3brâ&#x20AC;&#x2122;s with BIRâ&#x20AC;&#x2122;s, main with WIR + ensuite plus sitting area, main bthrm with spa bath, kitchen with gas cooking appls + dishwasher, dining/sitting with two gas log fires. 6 month lease. 5624 Calder Highway WHITE HILLS $330p/w 3brâ&#x20AC;&#x2122;s with BIRâ&#x20AC;&#x2122;s + ceiling fans, ducted heating throughout, sep dining + kitchen with gas cooking & dishwasher, 3 pce bthrm + powder room, back patio area with decking, powered shed, fully fenced with low maint. garden. 11 Knight St. FLORA HILL $340p/w 3brâ&#x20AC;&#x2122;swith BIRâ&#x20AC;&#x2122;s, main with ENS + WIR, sep lounge, ducted cooling, kitchen/dining with gas cooking + gas heating, 3 pce bthrm + sep laundry, lrge enclosed back yard. Garden shed + sngle grge. 19 Davey Close. EPSOM $360p/w 3brâ&#x20AC;&#x2122;swith BIRâ&#x20AC;&#x2122;s, main with ENS + WIR, sep lounge, ducted cooling, open plan kitchen/ living/dining, 2 living areas, ducted heating + split system air con, dble remote grge, enclosed yard with undercover pergola area. 231 Station St. IRONBARK $430p/w 3brâ&#x20AC;&#x2122;s with BIRâ&#x20AC;&#x2122;s, stunning kitchen, large open plan lounge with formal entry + study, formal dining room, 3 piece bthrm, ducted heating & cooling + split systems & ceiling fans, lrge laundry, plenty of rear backyard, dble grge with remote access & paved entertaining area outside. 346 Barnard St. QUARRY HILL $330p/w 4brâ&#x20AC;&#x2122;s with BIRâ&#x20AC;&#x2122;s, formal lounge, modern kitchen/meal areas, kitchen with d/washer, 3 pce bthrm, gas heating, cover rear deck, dble length carport, grge, patio. 120 Olinda St. KENNINGTON $370p/w 4brâ&#x20AC;&#x2122;s or 3brâ&#x20AC;&#x2122;s + study,ducted heating & cooling, timber kitchen with d/washer, electric overn & gas stove top, 2 living areas, family bthrm w. sep shower, generous sized laundry, decked outside area, lrge rear sized yard, dble grge. 38 Steane St.
To advertise in The Property Guide classifieds pages. LONG GULLY 25 SEMMENS STREET Great first family home! EMU CREEK 77 HARGREAVES ROAD An Equestrian Delight! BENDIGO 67 LUCAN STREET Build in the heart of town!